We as Americans may pride ourselves on the separation of church and state, but we still cling to a primitive Temple culture ruled by money, sacrifice and idolatry. It is a temple we created by abandoning all to market forces. The unleashing of the powers of deregulation, privatization and the shift in emphasis from fiscal policy to monetary policy have undermined democracy and created a plutocracy of wealth and special interests that rule our government (Krugman, Phillips). 'The Market' has become the temple of our culture. 'No one is bigger than the Market'. Meaning--The Market rules! There is nothing or no one that can stand in its way. It is impervious to our actions. It rules with an Iron fist. As we have sacrificed more and increasingly placed our faith in 'The Market' the power of its highest priest, its most sacred institution the Federal Reserve has grown. Steeped in 'the embrace of free markets' the Fed cloaks its self in mystery and conceals its meetings and actions from public scrutiny ('That Shreddin Fed', Robert D. Auerbach, Barrons, December 10, 2001). When we investigate and delve into its matters it is evident that it dispenses out injustice by abandoning the poor and bailing out the rich and powerful. Devotees of the market follow The False Prophet Adam Smith platinum rule of 'self interest'. They believe that they are guided by the 'invisible hand'. Whatever action they undertake will benefit the greater good. Entrepreneurs instead of looking to the God within focus their minds on how they can profit from the world around them. The world is there's to plunder. They have faith that whatever they do, the invisible hand will ensure that society will benefit overall. They convince themselves that that they are doing good things like building wealth, providing jobs, helping the economy grow.--never mind that it is the profit they are after. But the negative forces of self-interest sow the seeds of their own destruction. Where as the law of love (karma), do unto others, is guided by the law of abundance ('Gather as much of it as each of you needs,..'Exodus 16:16) the appetite of the law of self-interest is insatiable. It steeped in the negative forces of greed and violence that feeds on it self ---always desiring more and more, there is never enough. Injustice and inequity abound. Soon war ensues. All are consumed by the conflagration and eventually misery and violence devours all. In the aftermath when 'the market' has consumed all they will talk of 'creative destruction'. That all the misery and anguish caused by the destructive forces of the market were for the greater good and we have now set the stage for a new rebirth. That we need to have faith that The Market will come back bigger and better than before. Brothers and Sisters we made that mistake in the 1930's we must not make it again. The market is patently evil. How can we have the kingdom of heaven on earth if the whole world is a marketplace? If we are to 'liberate' ourselves from the market it begins by reducing the power of its high priests and sacred institutions such as the Federal Reserve. The Federal Reserve needs to be stripped of its power and independence and made accountable for its actions. We must no longer let a plutocracy of wealth and supranational entities such as corporations rule us. The following articles are meant to educate folks about how the Market and its high priests and institutions rule us. Speculator's Behind Oil's RiseSpeculator's are behind the price rise in all commodities from oil, to natural gas to basic food stuffs. Be Prepared--Don't Let a Financial Crisis Be ExploitedShould a financal crisis hit we need to be prepared and not let the Bush administration exploit it like it did 9-11 for political gain. The Japanese Paradigm To begin to understand how and what went wrong in America we start by looking at Japan. After all, Japan was modeled after America in the Post WWII period by MacArthur and the SCAP. They embraced the tenets of free market theory and rose to economic stardom in the 1980's only to crash in the 1990's. We are following the same script. Stop the money flow of injustice-Greenspan Protest The Federal Reserve is the power force behind the market. Just follow the money flow of injustice and it leads to the Federal Reserve. It is a clear conflict to the American principles of democracy: it is independent, free from Gao reporting and the Freedom of information act, supervises itself and can print money. Corporate Welfare-- The case, the face, the remedy People complain about corporate welfare and fail to realize that there is a face hehind it--the rich. 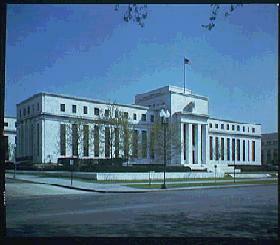 Federal Reserve Links The Federal Reserve page provides a listing with links of articles on the Federal Reserve on this web site. It also provides links to other sources of information on the web. Better to remove the words In God We Trust from our currency!